More often than not, it’s not at all hard to stumble across research from any given institution, that is engineered to produce the desired global warming or climate change deduction, even when completely conflicting data produces opposite results which then somehow mean the same thing. But, rather than trying to understand any given data dichotomy, it seems that most climate hoax researchers, no matter what, will throw up their hands and declare climate change/ global warming is happening, despite the conflicts in data. Case in point comes to us from two instances of research, from the same college, only a few months apart, that produces clearly opposite results that are then conflated to mean the very thing that they are seeking to prove, but on a leap of faith alone. “The study by researchers from Dartmouth College, the University of Maine and the University of New Hampshire, shows modern snowfall levels in the Alaska Range at the highest in at least 1,200 years, averaging some 18 feet per year from around 8 feet per year from 1600-1840. However, in a related study of climate change in NewEngland, Dartmouth researchers there indicate that warmer and shorter winters are resulting in far less snowfall, on average, pointing to the severe impact of climate change. “The impacts in New England are clear but perhaps seem more subtle,” says Mary Albert, a professor of engineering at Dartmouth’s Thayer School of Engineering. The study notes that recent winters have been ending sooner and the transition period between winter and spring has been getting longer. The vernal window, as this transition time is called, is opening earlier as the daily average temperature rises above freezing. So, which is it? 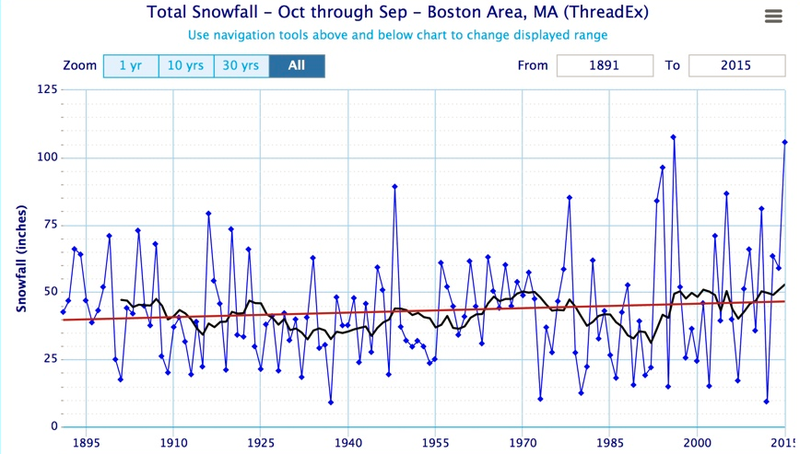 Does Climate change bring about more snowfall or less? Or both, dependent upon one’s viewpoint? In the current state of climate extremism, the data, no matter whether it’s cooler or warmer or snowier or dryer, always means climate change is here and it’s awful, and we’re in for it, no matter what. “The research was based on an analysis of two ice core samples collected at 13,000 feet from Mount Hunter in Alaska’s Denali National Park. The study suggests that warming tropical oceans have driven the increased snowfall by strengthening the northward flow of warm, moist air. So, much more snow means the Earth is warming, unless you’re in New England, which is subject to different climate laws, as of yet undeciphered, where less snow there, means climate change, alas. So, maybe Boston is merely under a special New England carve-out zone for more snowfall and harsher winters, meaning less global warming/climate change, but only there, who really knows? By the way, it should be noted that Dartmouth was fully and completely unaware that we captured and then linked the two conflicting research articles. Further, we remain unsure as to whether or not Dartmouth might even remain blissfully unaware of this particularly historic research bungle. But the question must be asked since they’re operating under only one grand climate change hypothesis, our question being; what if much greater snowfall, in any given area, might possibly point to global cooling?